Antonio Llona, vice president of Liberty Business. 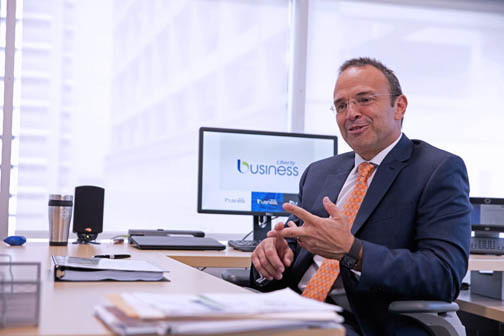 Liberty Business, Liberty Puerto Rico’s division that caters to the corporate sector, marked the first anniversary of its brand launch with a 9 percent growth compared to the same period last year, the company announced Wednesday. Establishing its own brand and conducting a publicity campaign to promote it were two factors behind Liberty Business’ growth, executives said. Another key element is Liberty Business’ product offering, he said. Throughout the year, the division has added other products with higher speeds, including its 330 Mbps Internet speed and Liberty Web Security. This product provides differentiated and personalized cloud security services that safeguard business customers’ Internet connection. These services include protection against cyber threats such as malware, ransomware and botnets, in addition to URL filtering and centralized reports. Liberty Web Security also enables customers to block unproductive content and protects their smart phones and computers while they are away from the office, the executive noted. Liberty Puerto Rico’s New Build project has also been key to help Liberty Business grow its customer base. “Definitely having a larger number of places with infrastructure allows us to become an option for more customers who have not had other alternatives available to them before. This also allows these customers to benefit from the speeds that only Liberty Business offers, in addition to other benefits such as installation within 48 hours, local 24/7 customer service and products and services that are custom made for their businesses,” Llona added. In February, Liberty Business established a partnership with the United Retailers Association of Puerto Rico (known for its Spanish initials as CUD) to help small and medium-sized businesses to promote their brands in the Puerto Rican market. The partnership seeks to provide these businesses with the customized telecommunication tools and services they need to reach local consumers. As part of this agreement, Liberty Business and the CUD provide a series of information capsules for small and medium-sized business, with valuable information on relevant subjects for businesses and how they can grow in a competitive market. Liberty Business will also participate in other CUD initiatives such as Zona Pymes, which aims to motivate Puerto Rican consumers to shop at local businesses, in addition to the establishment of a “Zona Pymes” in all island sectors that have small and medium-sized businesses. Just like the CUD partnership supports the small and medium-sized sector, Liberty Business offers a wide array of business services for the B2B segment, which includes symmetric Internet broadband speeds of 3Mbps to 10Gbps, dedicated Ethernet services for interconnection between locations, advanced telephony services (SIP and PRI) video services and service guarantees. Hey Buddy!, I found this information for you: "Liberty Business marks 1st year with 9% growth". Here is the website link: https://newsismybusiness.com/liberty-business-growth/. Thank you.